It’s citrus time! These bright, refreshing fruits are an especially fun treat when it’s dark and cold outside. Plus, with all the Vitamin C, eating citrus is a great way to stay healthy through the winter months. These unique microcitrus aren’t like any limes you’ve ever tried! They’re often called the “caviar of citrus,” because when you open them up, they’re filled with tiny caviar-like spheres. The skin of these finger-shaped limes can range from purplish or greenish black, to a light green or rusty red. To eat these fun gems, slice off the end and squeeze out the juicy lemon-lime flavored pearls. They taste like a cross between a lemon and lime and are slightly tart. They are delicious as a garnish in cocktails, sprinkled across salads or even made into in a citrus curd! Though this citrus looks slightly like a sea-creature, they make a great centerpiece for your table – and it smells great too! Mostly used for decoration and for its lovely scent, the Buddha’s Hand can also be zested and used in lemon bars, herb salts, salad dressings or martinis. No matter how you use this citrus, it’s sure to be a topic of conversation. These beautiful lemons are yellow and green striped on the outside with a lovely pink center, yet taste like a regular lemon, but with fewer seeds. Use them like you would a regular lemon and make lemon bars, pretty up a glass of water, or make pink lemonade! A Centennial Kumquat (or Orange Kumquat) is similar to a Nagami kumquat, but rounder. (The size is similar to a Mandarinquat). The flesh of the kumquat is sweet and the inside is tart, the opposite of what you would expect with citrus. You eat the whole thing, skin, seeds and all when enjoying a kumquat. The kumquats come in a variety of colors, including a variegated yellow and green striped kumquat that’s ready to eat. 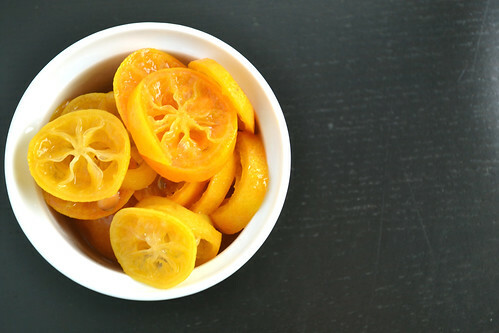 Try our candied kumquat recipe below. Though kumquats are a delight to eat as a snack, peel and all, they’re also delicious candied and used as a garnish on cupcakes, drinks or on a cheese plate. Bring the sugar and water to boil in a small saucepan. Add the kumquats and reduce heat to medium-low. Simmer for approximately 15 minutes, or until the kumquats turn translucent. Let cool and serve. How To Add Specialty Citrus Items To Your Delivery: CSA members – head on over to our online Farm Stand Market to customize your upcoming delivery. The Market is open from noon on Thursday until 6 pm, 2 days before your scheduled delivery day. After you confirm your produce items, click the orange button “Confirm and Continue To Other Farm Products” to add the products to your delivery. Can you just order vegetables and no fruits?